Zoo Paradise has just released a new Mystery Net. This net will show up automatically in everyone's zoo, and looks like a mystery animal hidden underneath a net. If you click on the net, you'll see the screen above telling you how many "snips" you need left. Each net requires 4 snips from four different friends. 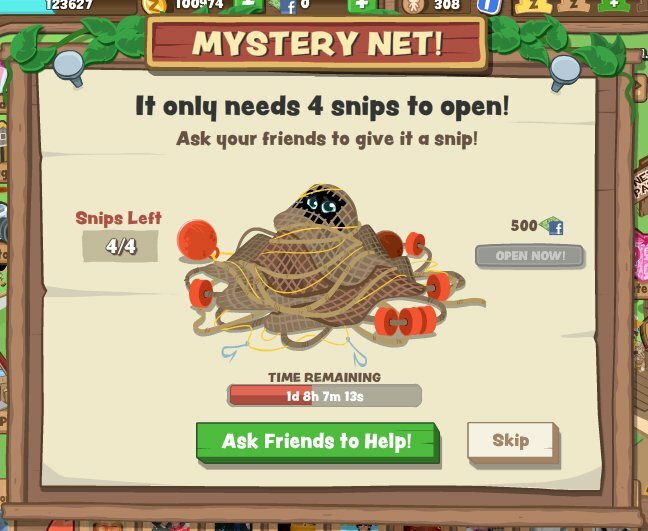 If you "Ask Friends to Help" you will post a message on your Facebook wall telling people that you need more snips to free your Mystery Animal. If you do not have enough friends, you can also purchase the mystery animal for 500 Facebook Credits. Once you have opened the net, it will go away. So far, it doesn't seem to come back but it could be a random chance to get another one of these nets. It appears that you can win any kind of animal from this Mystery Net, but we're not sure if that is 100% accurate. We saved a Pink Harp Seal from ours! The Pink Harp Seal is a new limited time animal that costs 62 Facebook Credits, so it's great to see that high quality edition items can come out of the Mystery Net. 500 Facebook Credits is a ton of money to unlock the Mystery Net, especially since the most expensive animal costs 71 Facebook Credits. Perhaps there are animals that are only available with the Mystery Net? What did you get from your Zoo Paradise Mystery Net? Let us know in the comments.